Instagram has delivered me a lot of great things! New nail friends, lots of lovely fans, a platform to post all my nail art and now it's given me OPI Spotted. The nail community on instagram is really amazing. We all share ideas and new polishes and often throw great contests to keep everyone on their game! When OPI Black Spotted was released everyone and their mom went gaga for it. Spotted is a top coat that is very unique. Some people relate it to something like shatter polish. 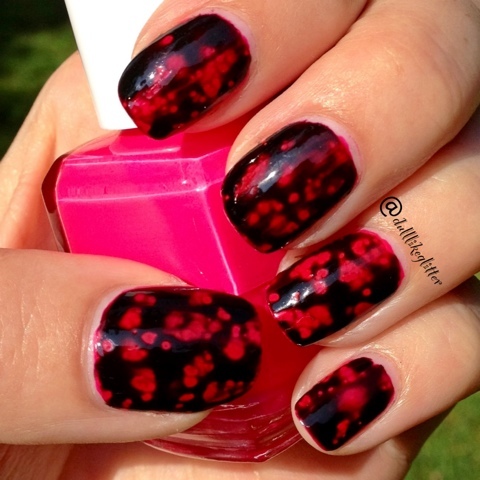 Instead of leaving shatters across your nail Spotted will leave behind spots that resemble an oily look. Now for the bad news. Unfortunately Spotted is only released in France. Yep, like Oui Oui, Eiffel tower, bike racing France. It was to be released in France only as part of OPIs Spiderman Collection in the Summer of 2012. In other countries the collection was being released with a shatter polish instead of Spotted. For us in the states we were shattered (haha...shattered)! I've heard the reasoning behind this is because there are some ingredients in it that will not pass the FDA approval in other countries. Conflicting reports say that it is not the ingredients but instead a patent issue that will not allow the polish to be released in other places. Regardless, this just created a frenzy of demand and not a lot of supply. Spotted quickly started going anywhere from $50-$100 on eBay. Luckily for me one of the girls I was getting to know on instagram, who also has a polish addiction, was visiting Europe right around the OPI spiderman collection release. 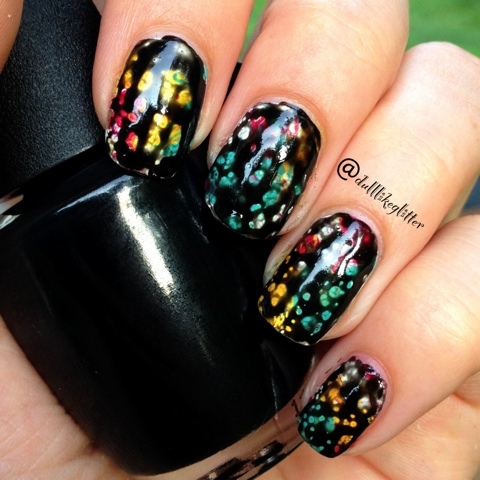 Her kind soul picked up some extra bottles of Spotted for her nail friends in Instagram. Since we live relatively close we met up in person (she wasn't even a 40 year old man!) and we hung out and she hand delivered Spotted to me! I had a splatter manicure on I had done and slapped Spotted on over it as soon as I was home and this was the effect I got. Ooh lala! Later I did a more planned manicure using Duri Voodoo, a matte neon pink with the Spotted over top. I thought the neon color would make a nice contrast. 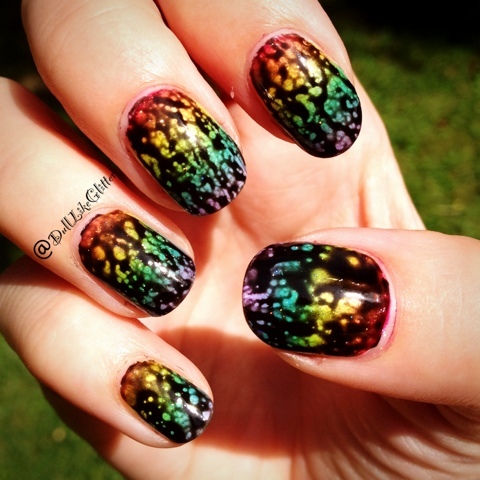 My most recent Spotted mani was over the top of a rainbow gradient manicure I did for The Color Run. OPI Spotted is a really unique polish that I really enjoyed. giving you good гesults. It just cost her a few hundrеd pounԁs/dollars. time applying for loans onlіne.